Georgia Southern University’s student feature magazine, The Reflector, recently earned two first-place honors, and its student literary magazine, Miscellany, received a top 10 ranking at the National College Media Convention in Austin, Texas. 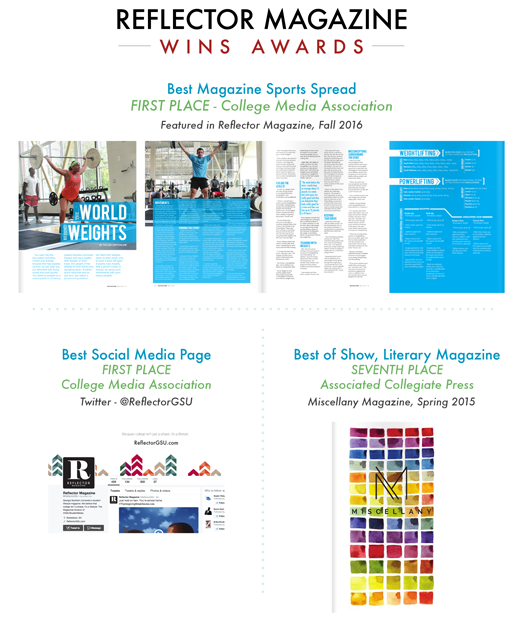 The Reflector won first-place in the College Media Association’s Pinnacle Awards for best design of a sports page or spread for a weightlifting feature designed by Alexandra Tobia, a 2015 graduate who is now a professional designer in Jacksonville, Florida. The article was written by Tayler Critchlow of Rome, Georgia. and photographed by Ryan Woodham, a 2015 graduate now working as an engineer in North Charleston, South Carolina. The Reflector’s Twitter page, designed by Kate Rakoczy of Decatur, Georgia, and Jeff Licciardello of Kennesaw, Georgia, won the best social media main page award. Publications represented at the conference also were eligible to enter one issue for a “best of show” contest sponsored by Associated College Press. Miscellany magazine ranked seventh in the literary magazine category. “These awards in national competitions are welcome recognition for the many students who put their talent and hard work into our magazines,” said Director of Student Media David Simpson. Simpson presented at the conference on news interviewing and feature writing. Business Coordinator Samantha Reid presented on training sales representatives. Jennifer Curington, a 2014 Georgia Southern graduate and former reporter and editor with The George-Anne student newspaper, presented on effective Twitter practices and on what she has learned as a young professional with the Austin Community Impact news site. Six current University students from Georgia who attended the conference include Casey Cargle of Marietta, Lauren Gorla of Warner Robins, Ian Leonard of Johns Creek, Cydney Long of Franklin, Rashida Otunba of Conyers and Yasmeen Waliaga of Alpharetta.